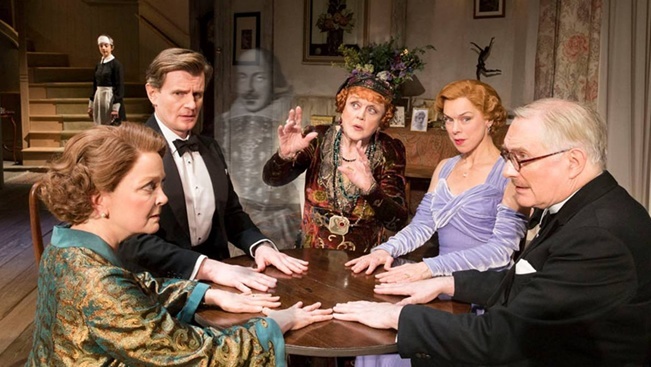 Audiences at last night's performance of Blithe Spirit were left reeling when Dame Angela Lansbury, reprising her Tony Award-winning role as medium Madame Arcati, took a drastic departure from the script and summoned the ghost of William Shakespeare to the Gielgud stage. The extraordinary moment occurred in the first act of the Noel Coward comedy during a séance scene in which, ordinarily, Madame Arcati summons the ghost of her client's dead wife. Last night, however, the events of the play were interrupted by a real life visitation from Britain's best-loved wordsmith. Shakespeare, though visibly confused at first, gathered himself quickly and addressed the stunned audience. "I have been humbled by your continued appreciation of my work," he said, "and indeed it is my work, all of it, and mine alone. But perhaps 'tis time you got over A Midsummer Night's Dream." It was hoped the Romeo and Juliet hit-maker would stay for a Q&A session after the performance but he declined to sit through the second act, though he insisted this was no reflection on the work of fellow playwright Coward; "I prefer Private Lives," he remarked. This was, perhaps, in the best interests of the audience as the show was already running late and there were severe delays on the Piccadilly Line. and captured Shakespeare's surprise arrival. "I wanted to do something to celebrate the 450th anniversary of the Bard's birth, and I knew it had to be special. I'd been watching a lot of Buffy the Vampire Slayer and those kids are summoning things all over the place whether they want to or not - pop out for some milk, come back with a demon - and I figured that having played a medium to such critical acclaim, I'd be able to pull off the real deal, and with more accuracy. All my years of acting training have given me great control: it's all about focus. Sunnydale would have been a lot safer if Buffy had gone to drama school." Blithe Spirit continues its run at the Gielgud Theatre until June with, it is thought, no further surprises in store.